From 2006, the industry’s hay and forage leader will launch a new look for its balers. 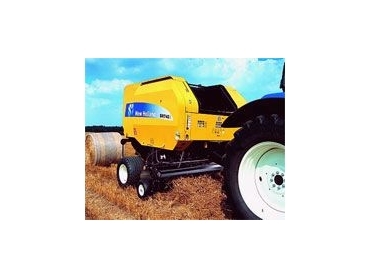 The most striking aesthetic change will be the new yellow colour - with the New Holland BR-A model round balers and BB-A large rectangular balers the first to undergo the change. The colour change will bring a greater degree of harmony to the New Holland product range, and in keeping with their leadership position make the balers stand out from the crowd. “All of our harvester products – from balers to combines – will now feature the same decal styling, incorporating the New Holland logo and an element of tractor blue, which emphasises the affiliation between our tractor and harvester products,” explained New Holland Marketing Manager, Simon Vigour. However there’s more than just a colour change underway. New Holland’s BR round baler series currently enjoys the number one position for market share, while the BB-A series has steadily grown share in a competitive contractor-driven market. “But we’re not prepared to rest on our laurels. Our new look balers also feature many improvements designed to increase productivity and performance,” said Simon. From 2006, Australian baler specifications will be aligned with both the European and New Zealand market offering, providing greater flexibility when it comes to sourcing units from these markets in peak times. “The end result for farmers is greater availability and less wait time for the latest in baling technology,” said Simon. Productivity enhancements on the BR-A series, include a move to net wrap only. “This is in keeping with the markets’ move away from twine tying. However twine will still be available as an option if requested,” Simon said. The pick up on the BR-A series has been moved rearward by 22mm in front of the rotor, resulting in better material transfer from the pick up tynes to the rotor fingers and smoothing crop flow from the ground into the machine, improving bale density. “We’ve increased pick up speed by 10 per cent and improved the pick up tyne bars and reel disc. We’ve also introduced longer augers with larger pick up flares to ensure even bale formation, reducing the requirement for excessive side to side manoeuvres in the windrow,” Simon explained. Overall, capacity is boosted by up to 15 per cent over the previous BR range, depending on crop and conditions.